"Hell isn’t so bad once you get used to it, but not everything for a wizard is sparkles and unicorns." It’s the 21st century. A wizard can use a smart phone, as well as perform outstanding feats one could hardly imagine. Eldrian is a clever young man aspiring to be the greatest wizard he can be, while also hiding from those who seek to catch or kill those like him. Him and Kevin must unite a band of colourful characters—some wizards and others something more—lest they fall to the government’s spellbreakers and wizards of their own. Demons always loom as a threat as well, but Hell isn’t so bad once you get used to it. 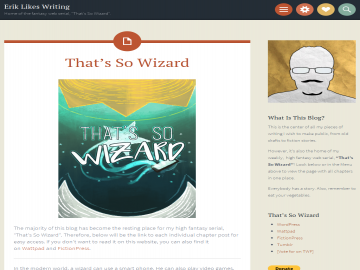 “That’s So Wizard,” is a high fantasy, light-hearted serial, but don’t let the latter adjective deceive you. There may be comic elements, but the story is meant to be an action-filled adventure with twists and turns that’ll hopefully inspire an emotion or two. That's So Wizard has not been tagged yet. Help others find That's So Wizard by tagging it! That's So Wizard has not been reviewed yet. That's So Wizard has not been recommended yet.